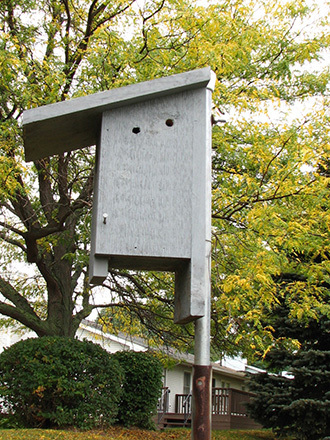 The bluebird and other cavity nesting birds we provide nest boxes for are susceptible to the many challenges of living in nature as are many species of animals and birds. Predation by other birds and animals, inclement weather, even vandalism, can cause losses of eggs, young and adults. In many instances you may be able to “diagnose” and handle the problem yourself. What will prepare you best is your knowledge of the bluebird’s natural history, how and when it lays its eggs, when the young hatch and fledge and what you might normally expect when you monitor your bluebird trail. In other words: Know what is “normal”. Knowing the proper construction of a nest box and where it should be placed may be critical to giving the bluebird the best chance of survival. Some emergency situations are listed below with suggestions to help you deal with them. To determine if eggs are viable, you must know the exact date when incubation started. For a completed clutch, 12-14 days is the normal hatch time, but cold temperatures can extend the incubation time. If you are unsure of the status of the eggs, leave the eggs in the nest and recheck in 5-7 days. If there are only one or two eggs in the nest, observing the presence of more would be evidence that the nest is still active. If the nest has failed, many times bluebirds will either remove the eggs or build a new nest over the top of the old one. First, cause no harm. If it has failed, you can remove the inactive nest with the eggs so the box can be used again. Dispose at a distance from the nest box so as not to attract predators. If you find the female bluebird dead with eggs, consider the nest lost. The male bluebird is not physically able to incubate the eggs as he does not have a brood patch. If you know the exact age of the eggs and that they have indeed been abandoned, you may have some success in placing one egg in another nest which you are certain has eggs of the same age. They may then be adopted and incubated successfully by the female. Placing too many eggs in another bluebird nest will place a dangerous burden on the parents when it comes time to feed the growing nestlings that result. This always is a very serious situation with, in most instances, a poor outcome. If the nestlings are older than 5-7 days, male bluebirds, under the right conditions (warm weather, plenty of insects), may be able to successfully raise young by themselves. Nestlings under 10 days of age need brooding at night or during colder temperatures. A wildlife rehabilitator (Department of Environmental Conservation and click on passerine birds) may be of great help in this situation if you cannot find one or two nests which might be able to accept a nestling of the same age. This is difficult because the adoptees will be competition for the young nestlings already in the nest and may cause it to fail compounding an already bad situation. Do not transfer any chicks during inclement weather. Chicks must be matched up closely so they are the same age and size. Failure to follow all of the above rules could jeopardize the entire nest. Female bluebirds can incubate, hatch, and raise a brood of nestlings by themselves. Single bluebirds struggle with large broods. Fostering out one or two chicks to another nest can help. Supplying mealworms will help the female with feeding her young. Try to determine what the predator is: Nest torn up and contents destroyed: Probable cause – cat or raccoon reaching in. No signs of nest damage but eggs gone or on ground: Probable cause – snake or bird (house wren or house sparrow removing eggs). Opening enlarged and roughened: Probable cause – woodpecker. Once you determine a cause, you can take measures to prevent it from happening again. 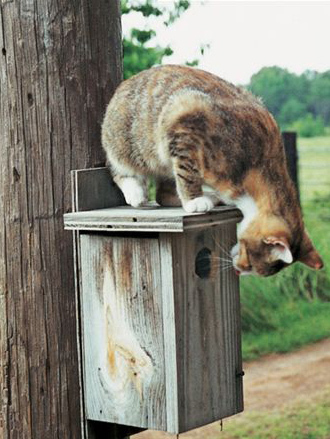 Cats have been known to climb up to 7 feet to the top of a nest box. Photo by Keith Kridler. If you have house sparrows competing with bluebirds, you need to evaluate your nest box placement. 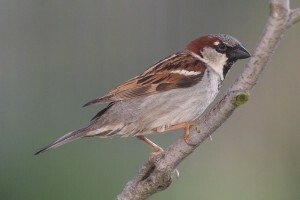 House sparrows are extremely territorial birds that will persist in an area until removed or you reposition your bluebird nesting boxes to an area away from them. Disappointing information, but house sparrows are usually found in habitat that should not be selected for bluebird nesting boxes.